It is time to bust out the Bitburger and secure a place on your favorite sofa to Stadion An der Alten Försterei. On Sunday, Germany is taking on Argentina in the FIFA World Cup 2014 final for the third, and perhaps most exciting, time. It is time to bust out the Bitburger and secure a place on your favorite sofa to Stadion An der Alten Försterei. On Sunday, Germany is taking on Argentina in the FIFA World Cup 2014 final for the third, and perhaps most exciting, time. If history and Germany’s last match against Brazil (oh the devastation!) has taught us anything, this is guaranteed to be a gut-wrenching match. First, let’s take a look back. Germany and Argentina first went head-to-head in the World Cup finals in 1986 in Mexico when Argentina won 2:3. They met again in 1990 when Germany, hosting the tournament, took the trophy with Andy Brehme’s famous penalty kick in the 81st minute. The stakes are high. Only eight countries have ever won the World Cup: Brazil (5 times), Italy (4), Germany (3), Argentina and Uruguay (2), and England, France and Spain (1). If Germany wins, they will tie Italy for the second greatest number of wins, and if Argentina wins they will tie Germany for third-most wins. Historically Argentina has been a fierce competitor against Germany, but when it comes to the World Cup, specifically, Germany dominates. 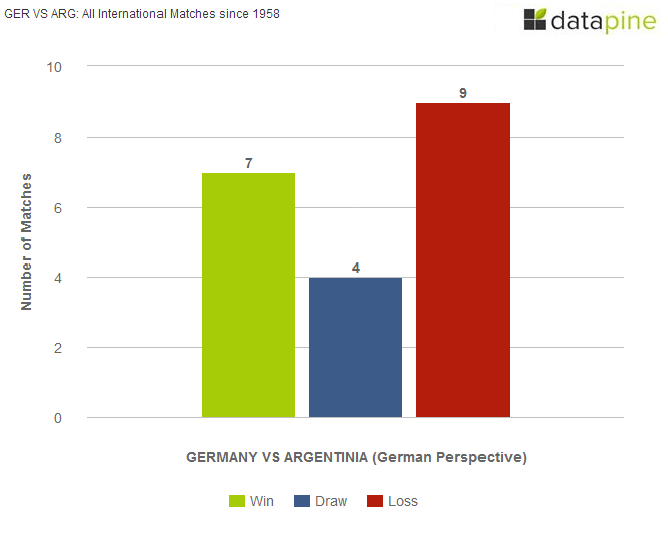 Let’s take a look at all international matches between Germany and Argentina since 1958. When it comes to all international matches, including World Cup games, the Gold Cup, Four Nations Tournament Berlin, the FIFA Confederations Cup, and friendly matches, Germany hasn’t always come out on top. Die Mannschaft, when facing Argentina, has seven wins, four draws and nine losses. Check out this link for the entire breakdown. But when it comes to FIFA World Cup games, the story changes. When looking at FIFA World Cup games only, Germany has a record of 4-1-1. In 1958, Germany beat Argentina 3-1 during a group match. 1966 was a draw at 0-0, also in the group stage. While Germany lost 2-3 against Argentina in the 1986 finals, the 1990 rematch in the finals put Germany on top with their 1-0 victory. In 2006, after a 1-1 draw in extra time, Germany won 4-2 in penalty kicks. This match was particularly famous for Jens Lehmann’s cheat sheetwhere he recorded the Argentine players preferred corners. 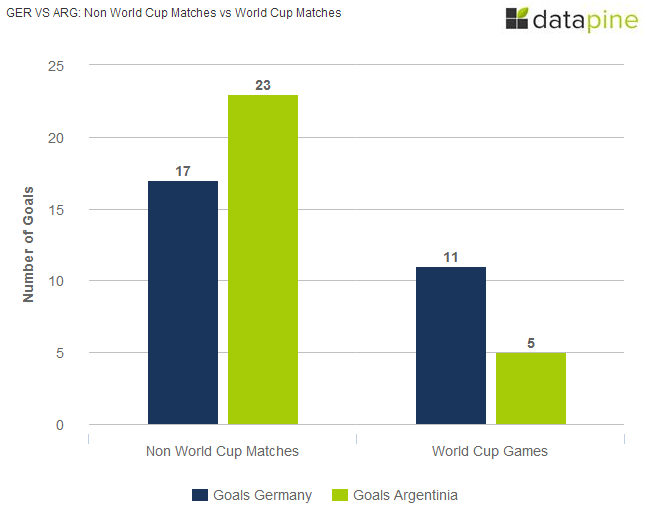 While Argentina has scored more overall, Germany has scored more in World Cup matches. The German team is a well-functioning machine when it comes to tournament play,and after looking at the data, we at datapine are predicting a big win for our homeland. So what kind of final can we expect Sunday at Estádio do Maracanã in Rio de Janeiro? Let’s break down the stats of both teams during previous games this World Cup. We expect a tight match, but with current statistics and with Germany being on their A-Game after slaughtering Brazil, our euro is on Germany. 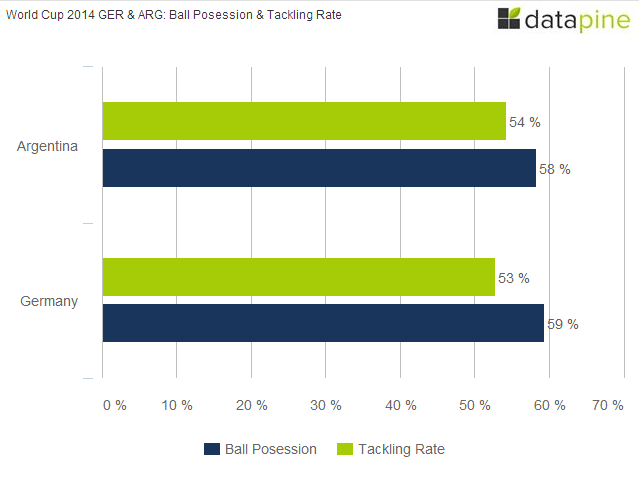 When looking at completed passes per minute: Germany has a 6.3 advantage to Argentina’s 5.1. The average time for an attempt on goal is 6.4 minutes for Germany to 6.1 minutes for Argentina. And, most importantly, the average time for a goal for Germany has taken this World Cup, takes place in the first half, 33.5 minutes in. Argentina’s average time to score a goal is much later at 75 minutes – deep into the second half, and Argentina has only won its games (except for the semi-final against the Netherlands which they won on penalty kicks) by 1 goal. But let’s dig a bit deeper. While on the field, both teams demonstrate their skills with comparable ball possession and tackling percentages. 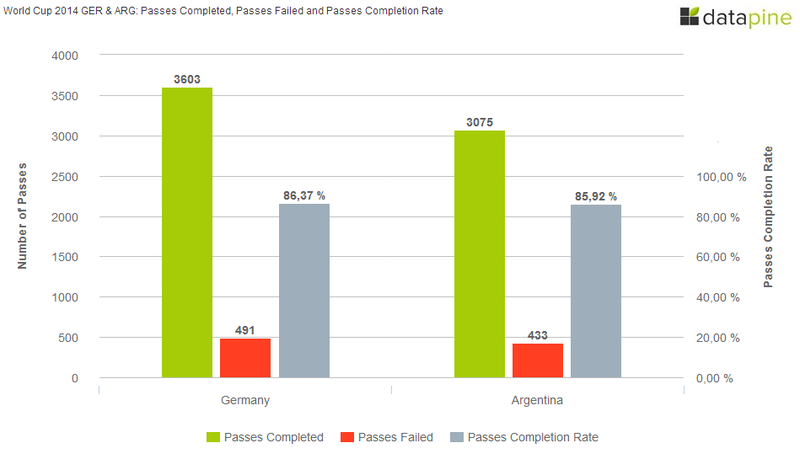 While these numbers are pretty close, Germany has over 500 more completed passes and with a higher completion rate than Argentina. 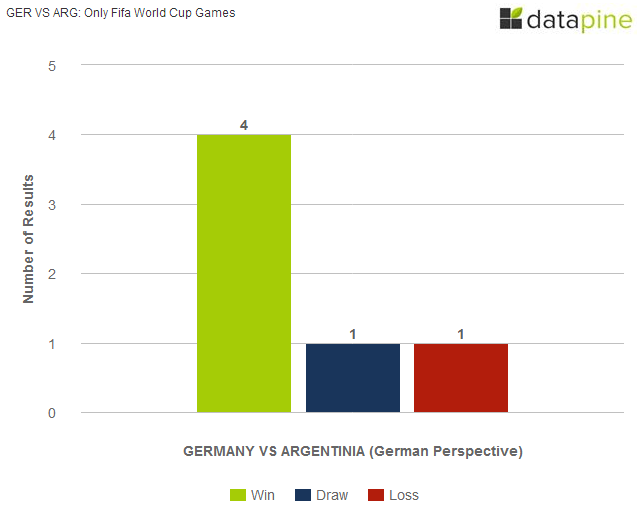 Germany needs, on average, 5.24 shots to make one goal, while Argentina needs 12.25. In the 2014 FIFA World Cup, Argentina has scored 8 goals out of 98 attempts. 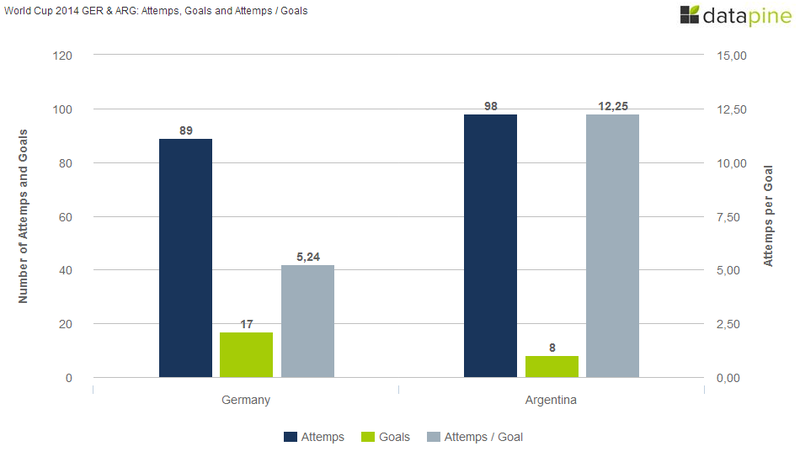 The Germans have scored significantly more, 17, while taking fewer attempts. The bottom line is that the German team’s powerful strikers are more accurate. 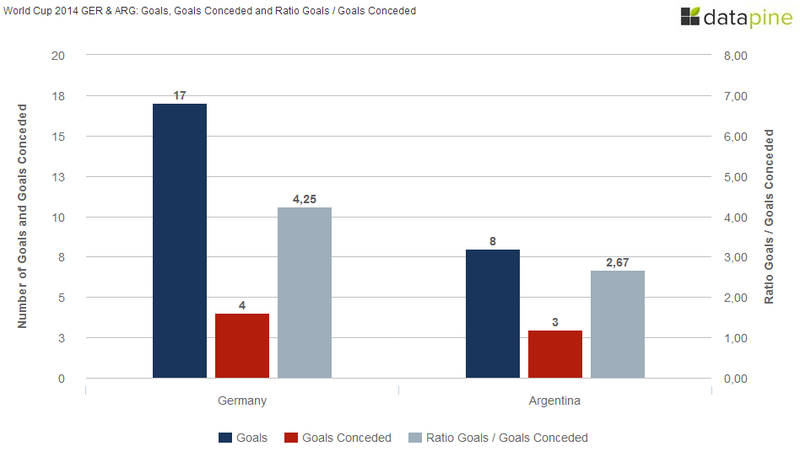 Germany also scored on average 4.25 goals per conceded goal, whereas Argentina scored just 2.67. Argentina has conceded only 3 goals this tournament (once by Bosnia-Herzegovina and twice by Nigeria). Germany has been scored on four times (twice by Ghana, once by Algeria and once by Brazil), but Germany has scored significantly more goals (17) compared to Argentina’s 8. And of course there are the individual players themselves. Miroslav Klose, who has played in the last four World Cups, set a new World Cup goal-scoring record, surpassing Brazil’s Ronaldo,with his 23rd minute strike against Brazil on Tuesday, bringing him to 16 total World Cup goals and two this tournament. And 2010 FIFA World Cup Golden Boot winner Thomas Müller, who already has five goals this tournament, isn’t far behind with 10 goals at World Cup games. And even if the strikers are not on their A Game – there is new titan Manuell Neuer, who we guess is already in possession of his own cheatsheet. Given all of these statistics, the odds seem to be in Germany’s favor, but numbers only take you so far. Our faith is in the German national team. Can you imagine the new record-breaking statistics we’ll be analyzing in the next World Cup in 2018 when Germany heads to Russia on the lookout for a back-to-back victory? Schlaaaaand! This data is powered by datapine.